It’s definitely time for lamb shanks again!! They’re very easy to prepare, you just need to think ahead a bit to allow time for them to slowly cook. Don’t let the anchovies in the recipe put you off. They add a subtle flavour and you won’t be able to distinguish them from the rest of the ingredients. If you feel that you must leave them out, don’t include them in the gremolata garnish but definitely don’t leave out from the dish itself. Serve the shanks with mashed potato, pumpkin or kumara or polenta. Heat the oven to 180°C. Heat a little oil in a flameproof lidded casserole dish and brown the lamb shanks. Set them aside and add the onions, carrots and celery to the dish. Cover and cook gently till soft. Sprinkle over the flour and stir for a minute. Add the tomatoes, wine, bouquet garni, and anchovies. Add the lamb shanks making sure you spoon juices over the shanks as they probably won’t be covered in liquid. Finally nestle in the garlic head halves with the cut sides up. Cover with baking paper and put on the lid. Cook for 30 minutes then turn the oven down to 160°C. Depending on how big the shanks are, they’ll take 2½-3 hours to cook. After an hour turn the shanks over. If the sauce has reduced and thickened a lot, add more wine or a little water. Check every so often and turn them again and add more liquid if necessary. Half an hour before the end of cooking, add the lemon zest and juice. Also squeeze all the garlic from the skins and mix the pulp into the sauce. Discard the skins. Check the seasoning. Make the gremolata by mixing together all the ingredients. 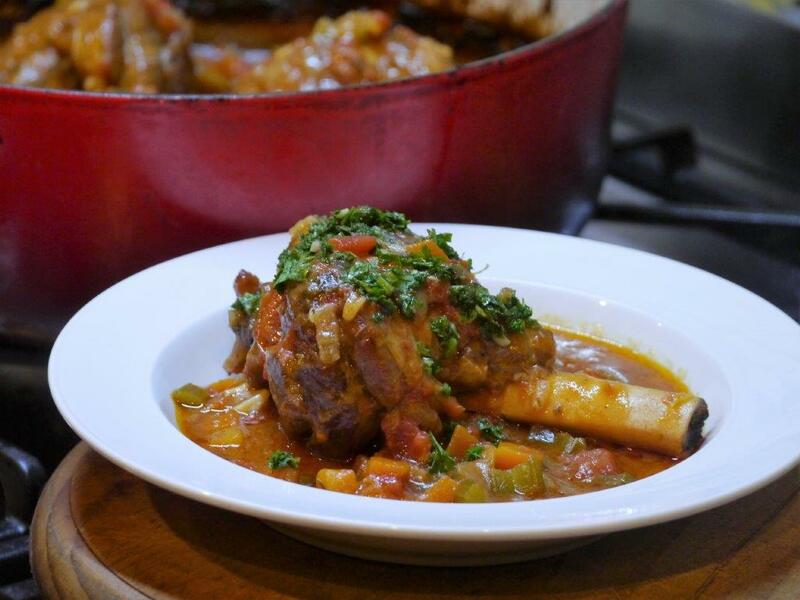 Serve the lamb shanks topped with the gremolata.